Expressing her gratitude for the scholarship and sharing what she has learned is something that Erin looks forward to at the Colleagues meeting in May 2019. Brenna Jordan was in junior high when she was gifted with a calligraphy kit for Christmas. Mostly self-taught from books, she first did calligraphy for herself, friends and family. Three years ago, she joined Colleagues and began to attend IAMPETH conferences. Brenna says, “I have a calligraphy business in my home now, and serve clients with their project needs. My goals for the future are to continue to improve and create, to expand my services to clients, and remain active in the Colleagues guild.” Brenna lives and works in Duluth, MN. 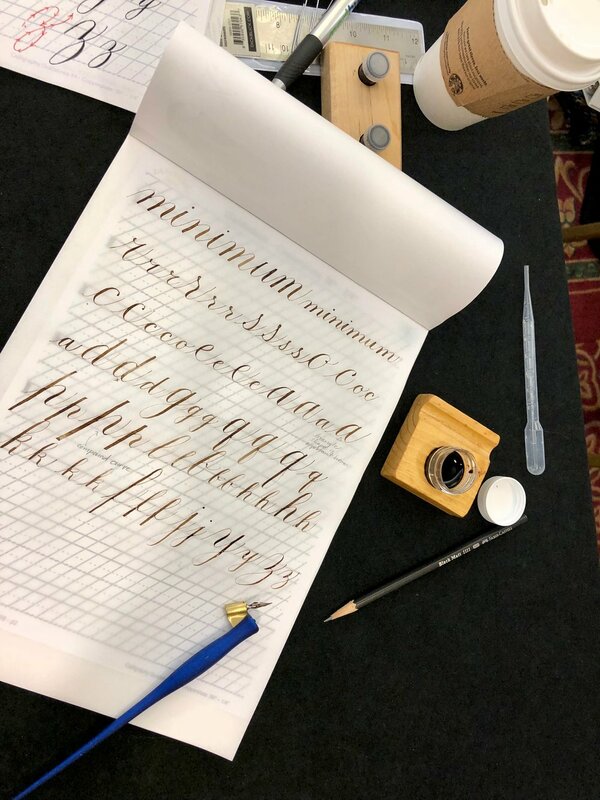 In 2017, Brenna studied letterforms, color, design and more with noted calligrapher/teacher, Tim Botts. This took the form of two one-on-one mentoring sessions at Tim’s studio in Glen Ellyn, IL near Chicago. Homework was assigned, completed and critiqued. Later she attended a weekend workshop with Tim, entitled “Word Pictures”. While there, Brenna and other students learned how to portray the meanings of words through the artistic expression of calligraphy. Julian Kittelson-Aldred will put pen to paper in the Demo Corner.